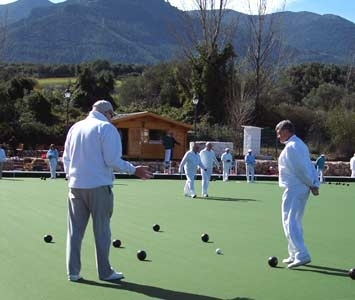 The newly established club is now of to a good start, attracting experienced regular bowlers as well as local bowlers who had previously found it too far to travel to the coast. There is also a pleasingly high percentage of new bowlers. 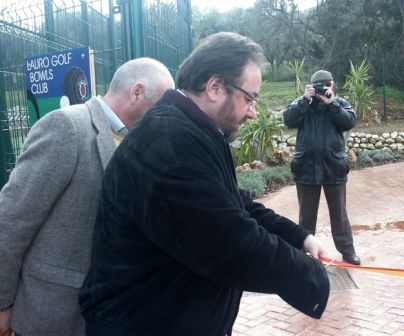 After the official opening at 1400 by the illustrious Mayor, Lauro Golf Resort Manager Mr. Carlos Pitarch, and Lawn Bowls Club Director Mr. Kenneth Talbot, the participants enjoyed canapés and refreshments catered by Bar la Risa followed by an exhibition match. That first weekend was open, so all those who visited were invited to try out the green, (supplied by Dales Sports Surfaces), free of charge, including free instruction for beginners. East-West: Passing Malaga airport turn left on the A386 towards Alhaurin de la Torre. From Alhaurin de la Torre take the road to Alhaurin el Grande on the A404. Lauro Golf is on the right side of this road. West-East: Take the Ojen road from La Cañada shopping complex, Marbella. Keep on the motorway until the Alhaurin de Grande exit. Avoid passing through the centre of Alhaurin de Grande, following the A404 towards Alhaurin de la Torre. Lauro Golf is on the left side of this road.